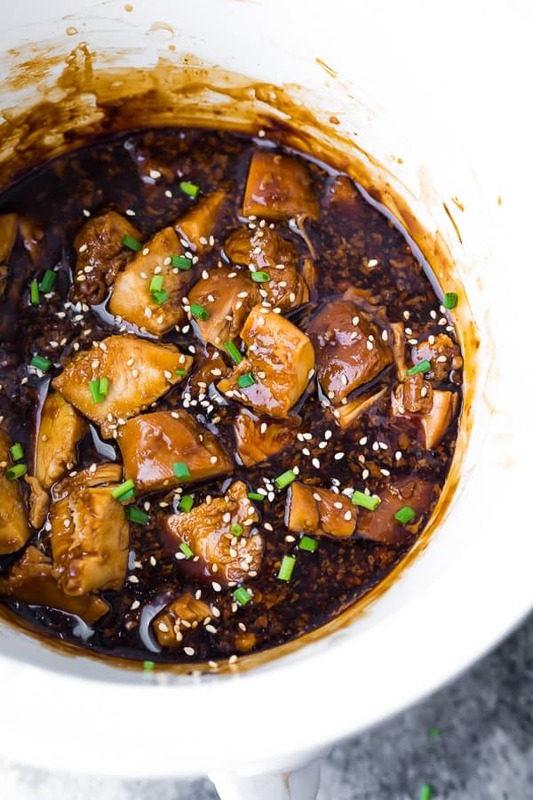 After sharing seven freezable slow cooker chicken recipes with you, I’m going through and photographing the finished products, including this slow cooker teriyaki chicken. 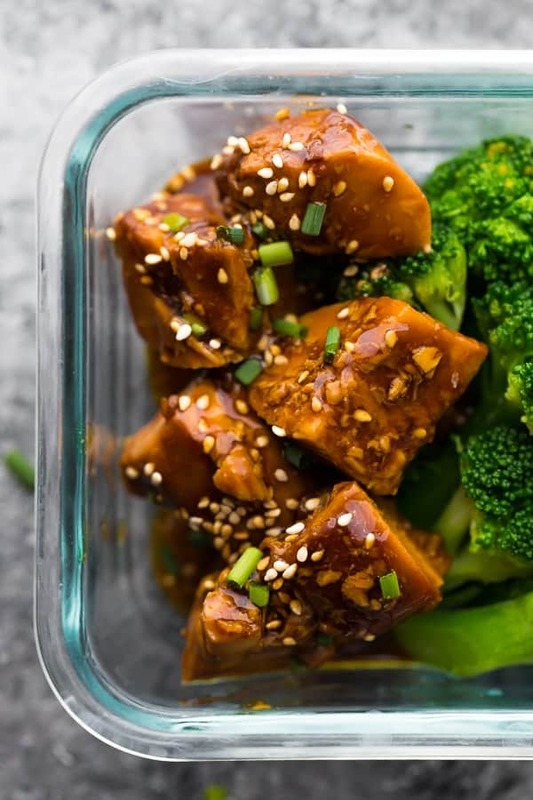 Teriyaki is a favorite amongst both adults and kids, and for good reason! It is packed full of sweet and savory flavor but isn’t too spicy. It pairs with any number of protein or vegetables, and is super easy to prep. Assemble the boneless skinless chicken breasts plus all remaining ingredients (except for the cornstarch) in a gallon-sized freezer bag. So incredibly simple! When you’re ready to cook, you will need to thaw completely before placing everything in the slow cooker and cooking on low for 3-4 hours. 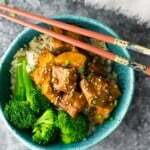 This slow cooker teriyaki chicken recipe is awesome because not only do you end up with some seriously flavorful chicken, but a delicious sauce to spoon over your rice and veggies. Can I use chicken thighs in this recipe? Yes! 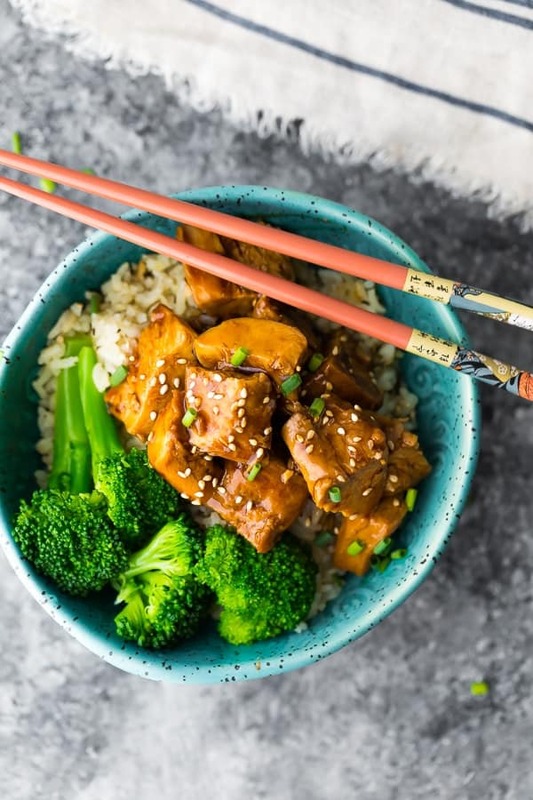 We love using boneless skinless chicken thighs in this crockpot teriyaki chicken recipe. I would adjust the cook time to 4-5 hours on low. How can I make this recipe gluten-free? Simply swap the soy sauce for tamari or coconut aminos, and make sure your mirin is truly gluten-free. Can I add vegetables to this crock pot chicken teriyaki? Yes! We love adding sliced vegetables (such as bell pepper and onions), snap peas and asparagus during the last hour of cooking. You can also add broccoli florets during the last 1-2 hours of cooking. 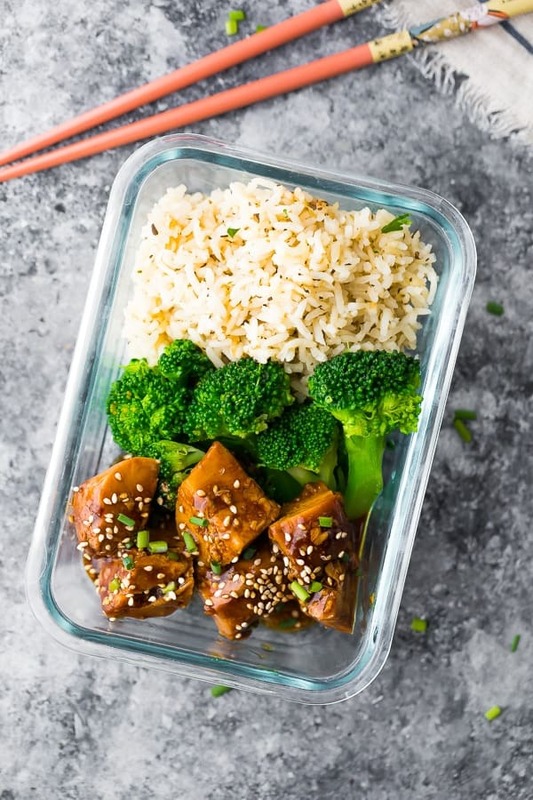 This recipe makes for great leftovers, and you can even portion out the teriyaki chicken with rice in meal prep containers and freeze for up to 2 months. 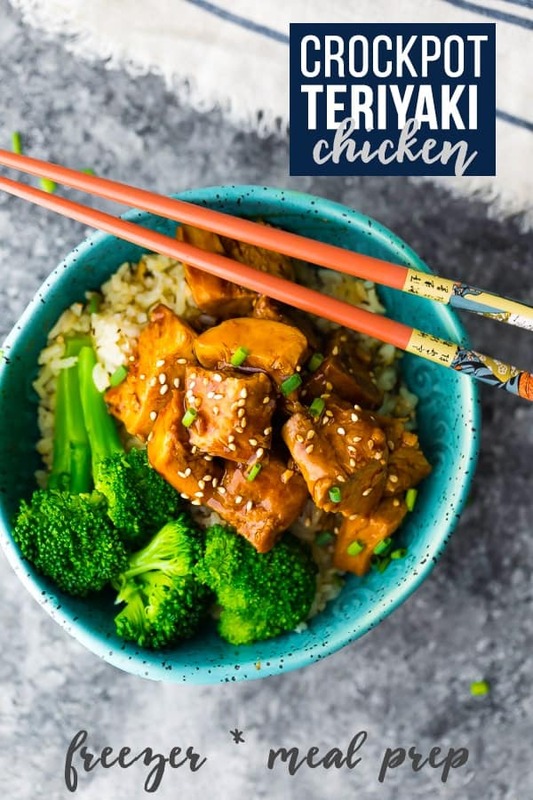 Crock pot teriyaki chicken recipe can be assembled ahead and frozen for easy weeknight dinners! Serve over rice for an easy weeknight dinner or meal prep lunch. Remove the chicken from the slow cooker, cut or shred, then return to the sauce. Serve over rice. I made this recipe over the weekend to meal prep for the week but something must’ve not gone right. My sauce turned out to be very cloudy with chicken bits and didn’t have your nice dark shine. It still tastes fine but doesn’t look too appetizing. I cooked it on slow for 4 hours since I had a little more closer to 3lbs of chicken. Would you have any clue on where it had gone wrong? Hi Terri, it’s hard to say from your description. It could be that with more chicken the sauce didn’t thicken properly? Hi Denise, I made this recipe over the weekend to meal prep for the week but something must’ve not gone right. My sauce turned out to be very cloudy with chicken bits and didn’t have your nice dark shine. It still tastes fine but doesn’t look too appetizing. I don’t have corn starch. Can I eliminate (or substitute) it? You can swap cornstarch for arrowroot powder (use about half the amount to start and add more if it doesn’t thicken). Other than that, you can leave it out but your sauce will be thin and it might not have as much flavor. Hello! 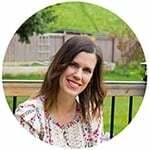 We are working parents and usually need SLOW slow cooker recipes. I’m talking 10 hours. Is there a way to modify this recipe to work with the extra time? Would cooking on high change anything? Hi Judith! I haven’t tried. It should work (with a shorter cook time), but keep an eye so your sauce doesn’t over-reduce and burn. Let me know if you try it! Hi! Would it be possible to use coconut aminos in place of low sodium soy? Hi Chinne! I bet that would be OK, however I’ve noticed coconut aminos are quite salty…I might add a little less than the recipe calls for and add in a bit more if it needs more flavor. Hope this helps! Can I use previously frozen chicken breast once they’ve thawed out enough to separate? If you are making freezer packs- yes! Just thaw enough to portion them out, then freeze before they thaw. If you are cooking, I recommend thawing completely. Hope you enjoy! Can you use bone IN chicken too? Hi Kathy, I bet that would work fine! I would cook for 4 hours 🙂 Hope you enjoy! Do you cut up the chicken before cooking? Hi Merrell! No, you cook the chicken breasts whole, then cut before serving. You could also shred them before serving! I’m allergic to honey. Can you recommend an alternative ingredient for it? You can swap for equal amounts of maple syrup or brown sugar 🙂 Hope you enjoy! How much water with the cornstarch? 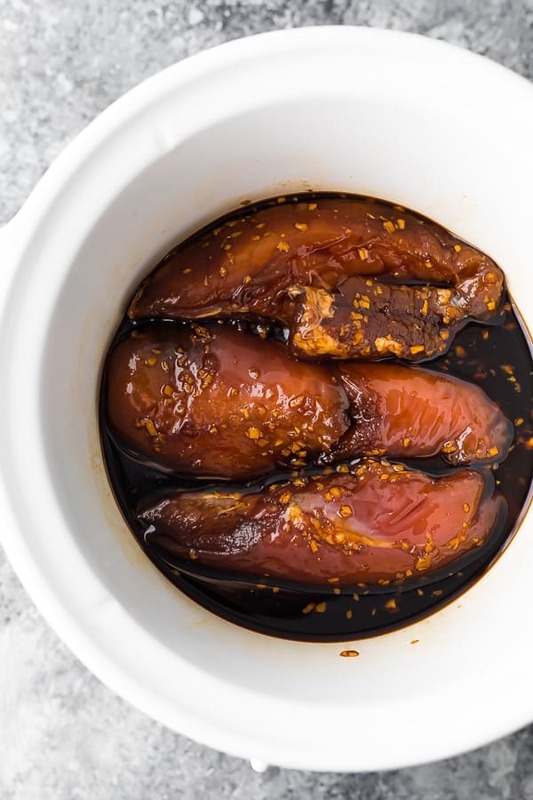 Can you substitute another ingredient for mirin? I have never heard of this ingredient before. Thanks so much for all your delicious recipes!! Hi Deb! You can leave it out. Sorry for what might be a daft question, but when you refer to the Crock Pot as a Slow Cooker, do you mean a conventional slow cooker, or an electric Crock Pot pressure cooker?